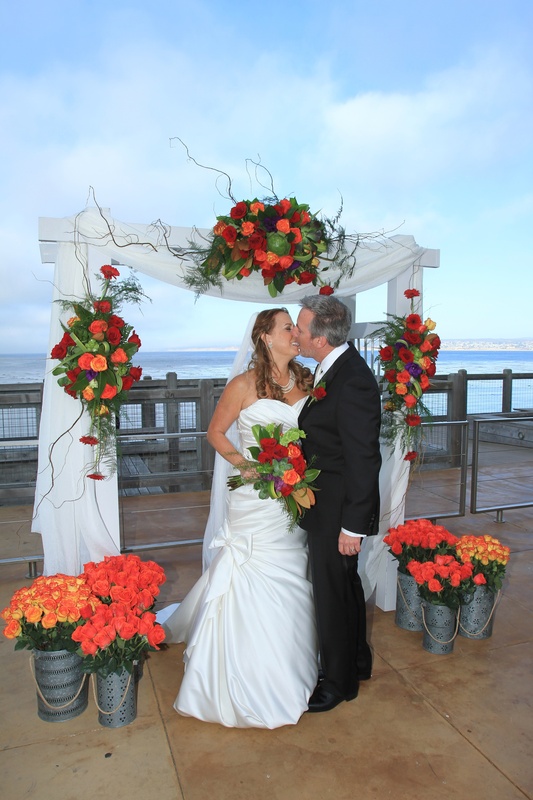 I just returned from coordinating a wedding that qualifies for the “Dream Wedding” category on all counts – a beautiful couple, a spectacular location, incredible weather… and then some! 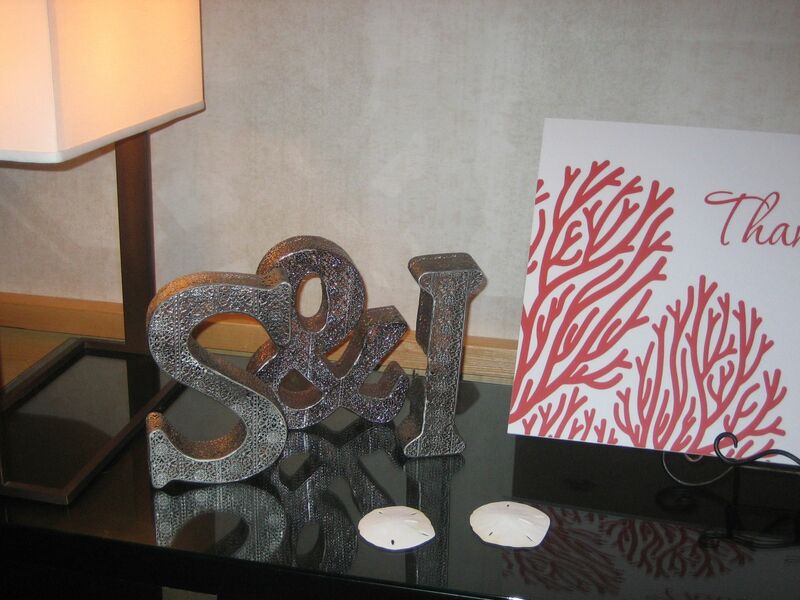 So, let’s start at the beginning – with Stacy and Ian: both of them seasoned singles, wildly successful in their respective careers, independent spirits. 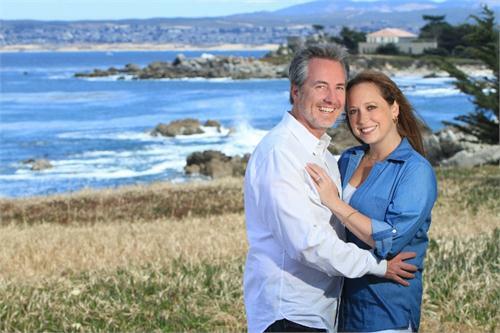 They had everything in their lives except for… well, that “significant other.” And then, on January 27 of 2013 (yes, 2013!! ), Love struck. Suddenly, unexpectedly. 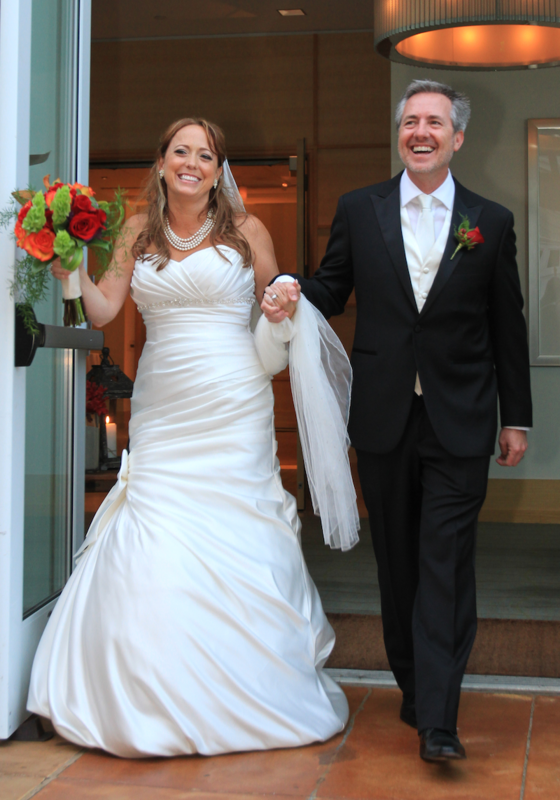 Stacy met Ian – and later that same day, she called her mother and said, “I have met the man with whom I want to share the rest of my life.” Love at first sight, nothing less! 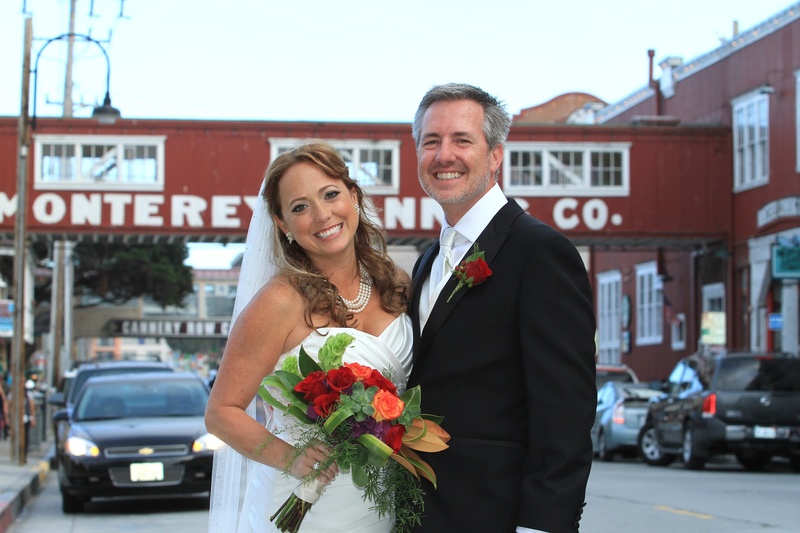 From then on, the two had a true whirlwind romance. Just eight weeks later, on April 1st, Ian proposed in a historic castle outside Rotterdam, the Netherlands – beginning with: “This is not an April Fool’s joke…” and putting a huge “rock” on Stacy’s finger. 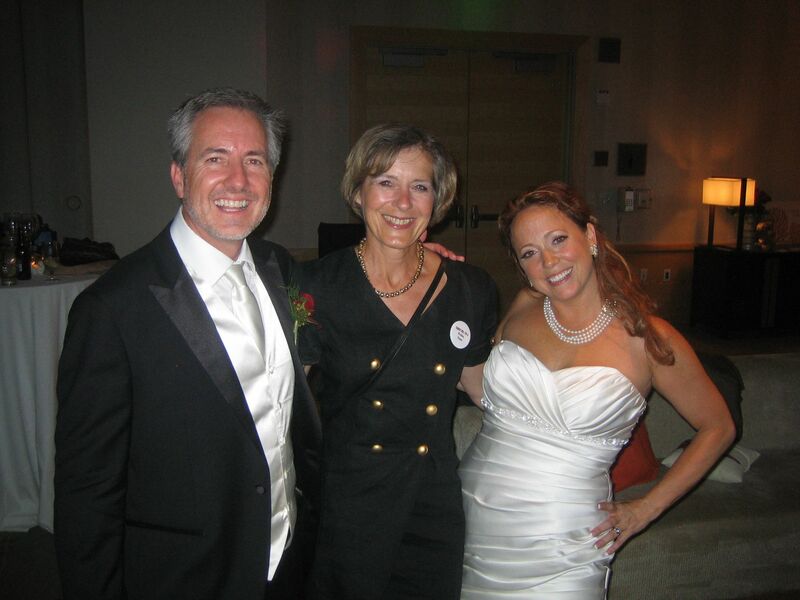 Another four months later, the two got married, and I had the honor of being their wedding coordinator. 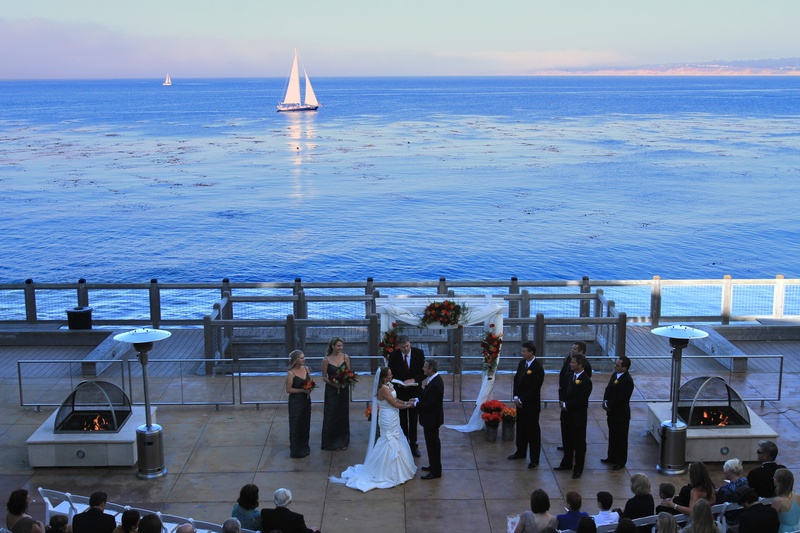 For their venue, they chose a spectacular waterfront setting in Monterey: the Intercontinental The Clement Hotel, literally built on the water’s edge. 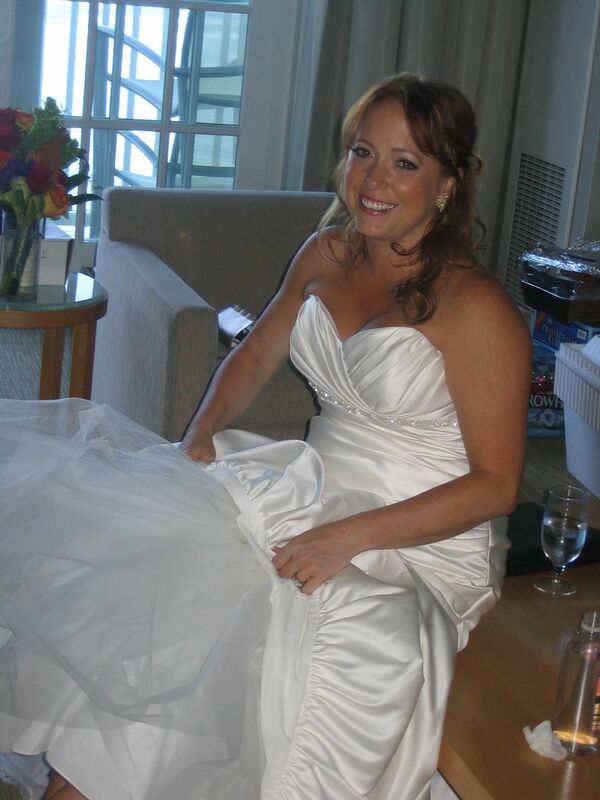 The morning of Wedding Day was dedicated to pampering and hair and makeup appointments at The Spa at Intercontinental, and the results for the bride, her mother and her bridesmaids were simply beautiful! 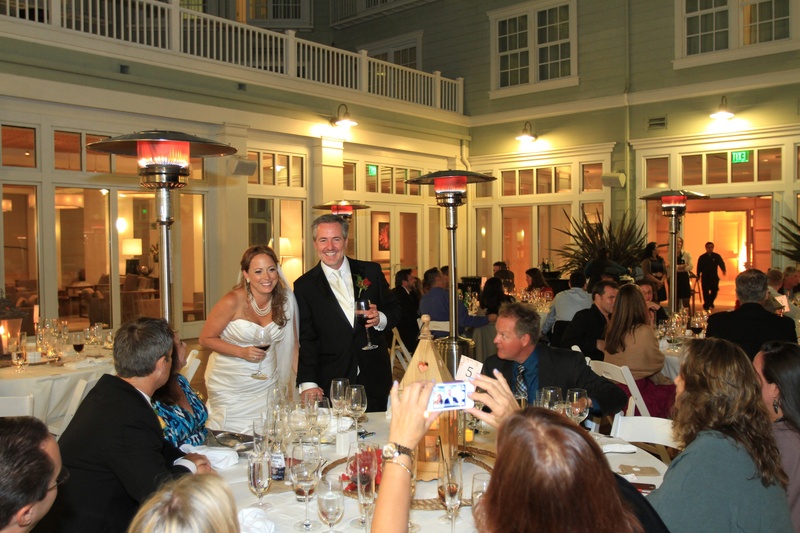 The ceremony, officiated by John Kelly, was held on the oceanfront terrace at 5 in the afternoon, in the presence of 70 of Stacy’s and Ian’s closest friends and family members. 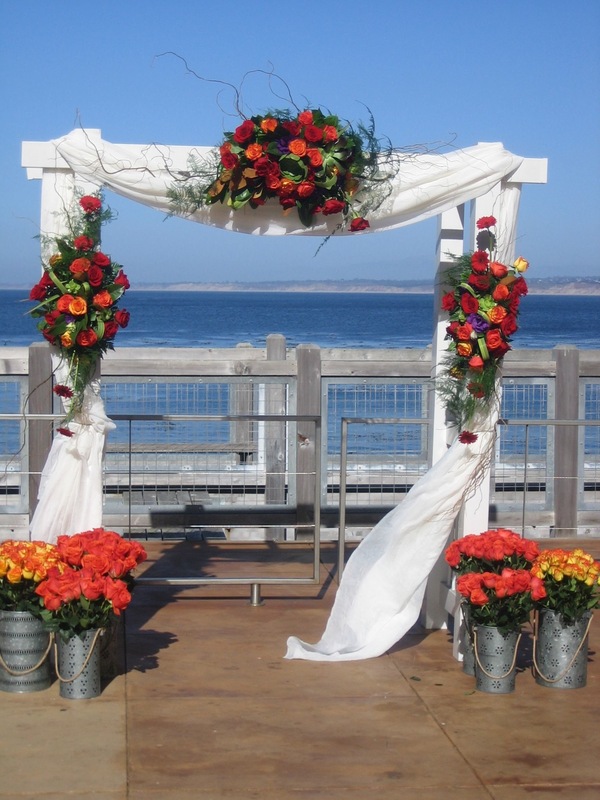 An arch, beautifully decorated by Stems Floral Boutique, with the Pacific Ocean as backdrop, and 725 roses in a symphony of sunset colors lining the aisle provided a truly glorious ceremony setting. 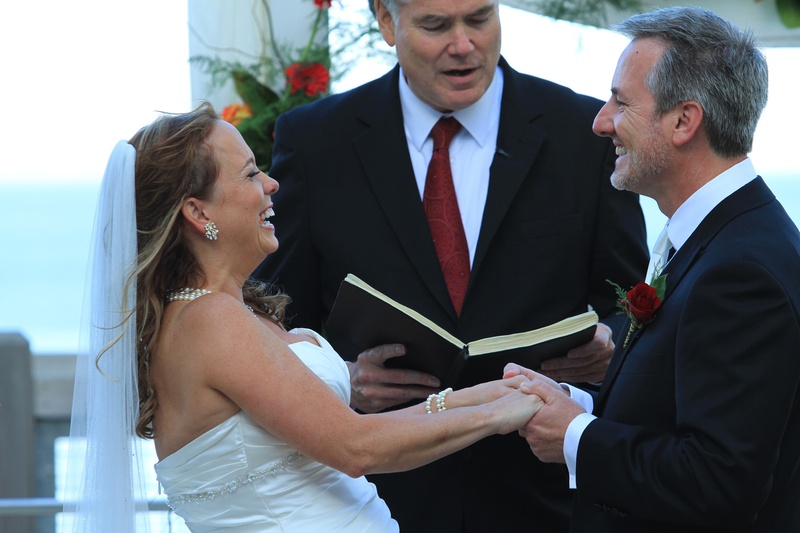 With the Abbott Brothers, a bluegrass band, performing Beatles classics for the processional and recessional, bride, groom and all their guests were immediately transported into a festive and joyful mood. 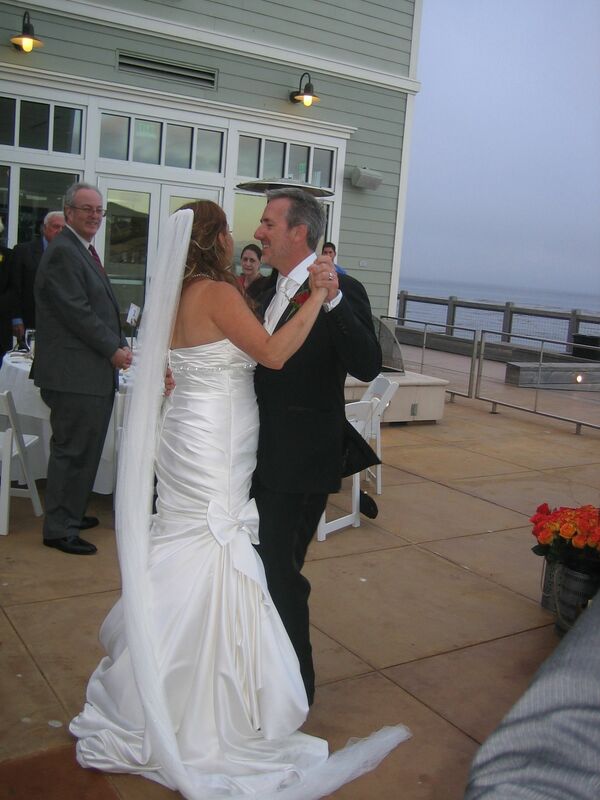 “Ob-La-Di, Ob-La-Da…” (with the lyrics ever so slightly modified to “Ian and Stacy”) and for the guests to sing along – I’ve never seen a couple happier than these two, dancing down the aisle! 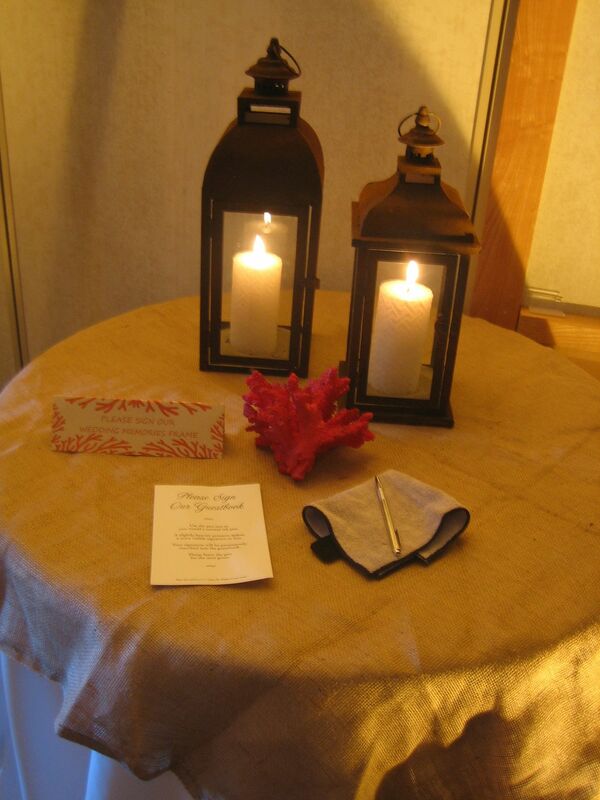 … lovingly decorated in the couple’s maritime wedding theme: corals, starfish and sand dollars! 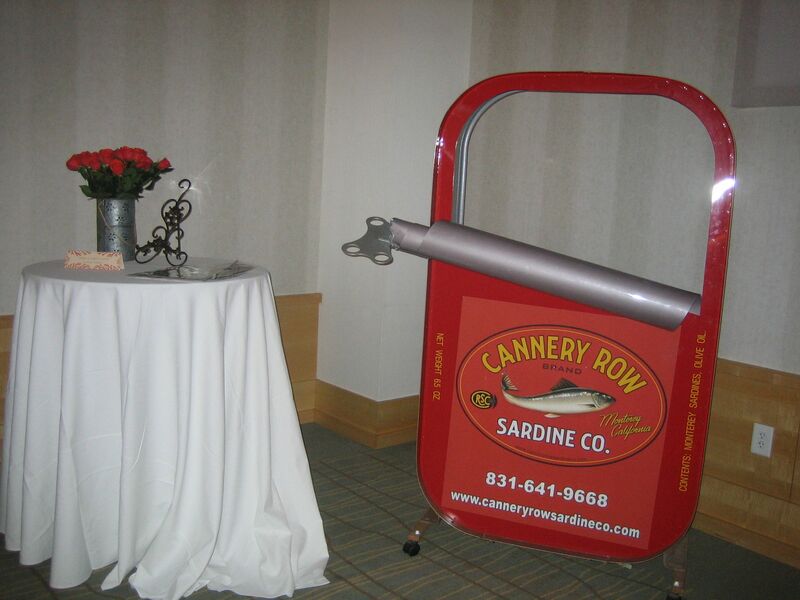 And the icing on the cake: a quirky, one-of-a-kind “sardine tin” photo booth! 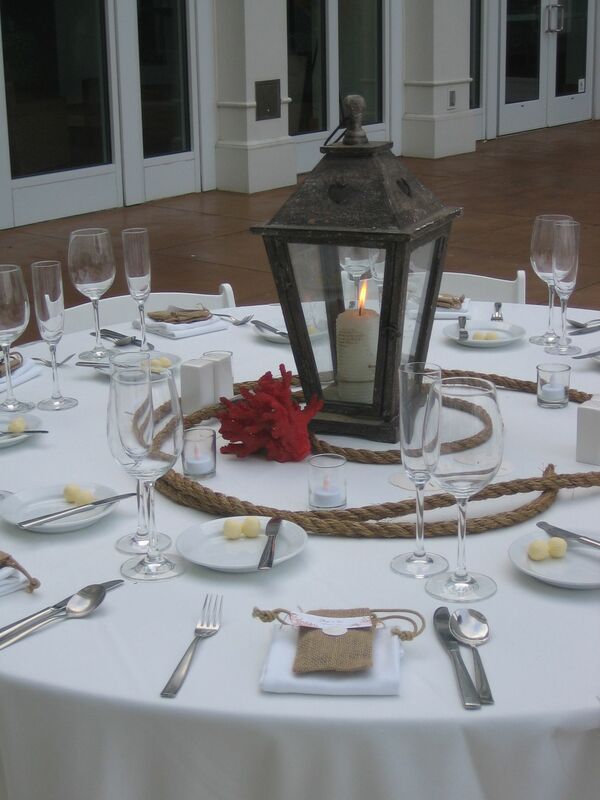 And then it was already time for dinner under the stars – out on the patio with a view of the sunset over the Ocean. 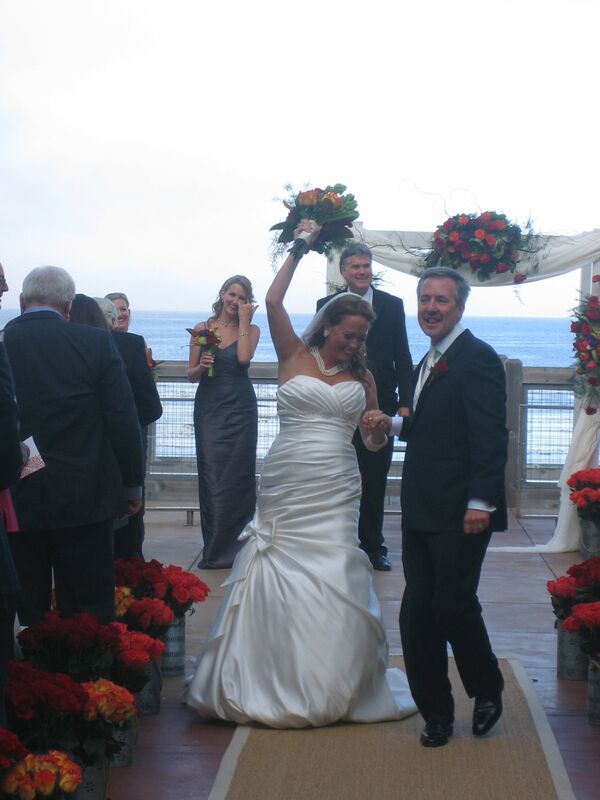 The couple, breaking with tradition, enjoyed their First Dance right then and there! 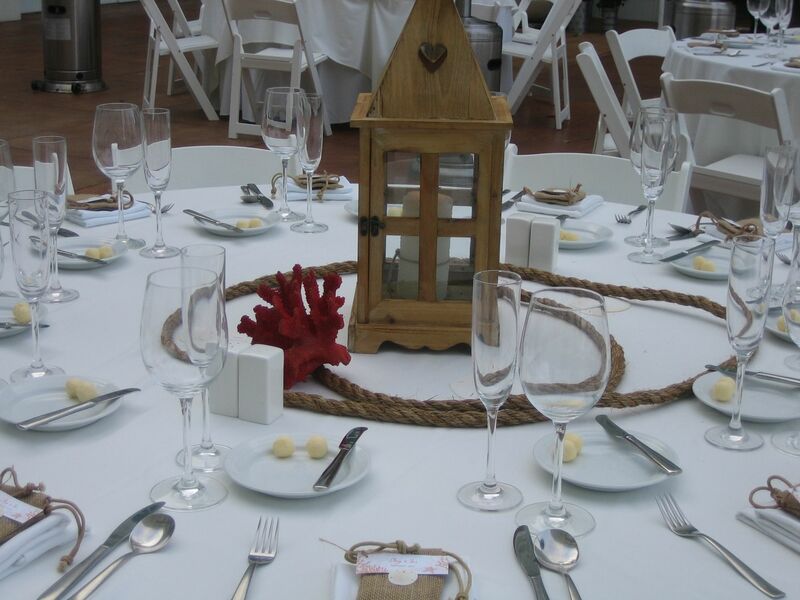 Every table setting was topped by a favor: a pretty burlap pouch, decorated with – what else? 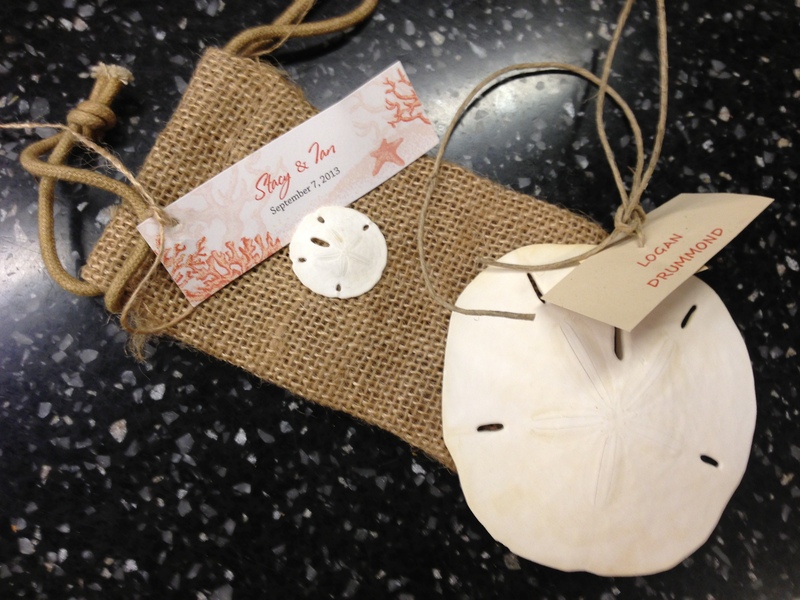 a mini sand dollar! 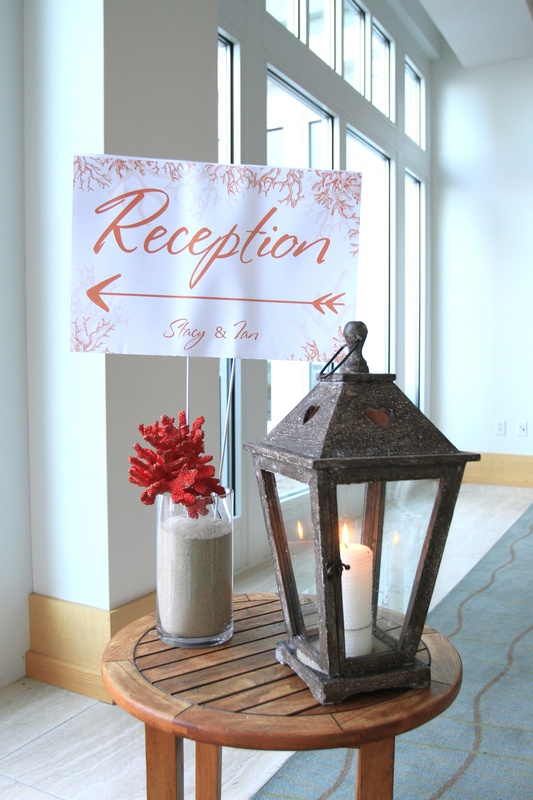 …and containing chocolate bars to satisfy any sweet cravings until cake-cutting time. 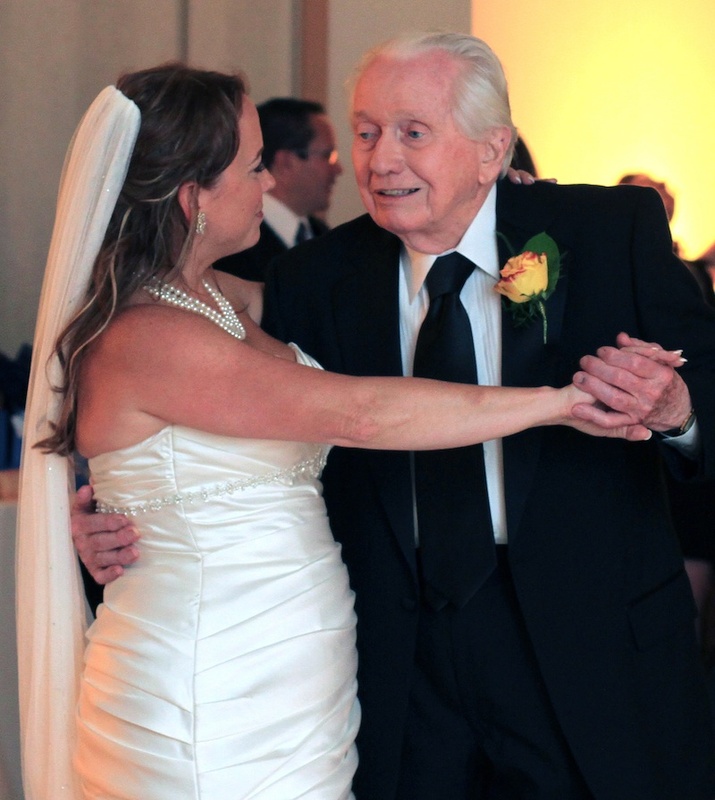 Following dinner, everyone congregated in the ballroom for dancing to the tunes of DJ Darion of DNA Entertainment, beginning with the traditional Father-Daughter dance. 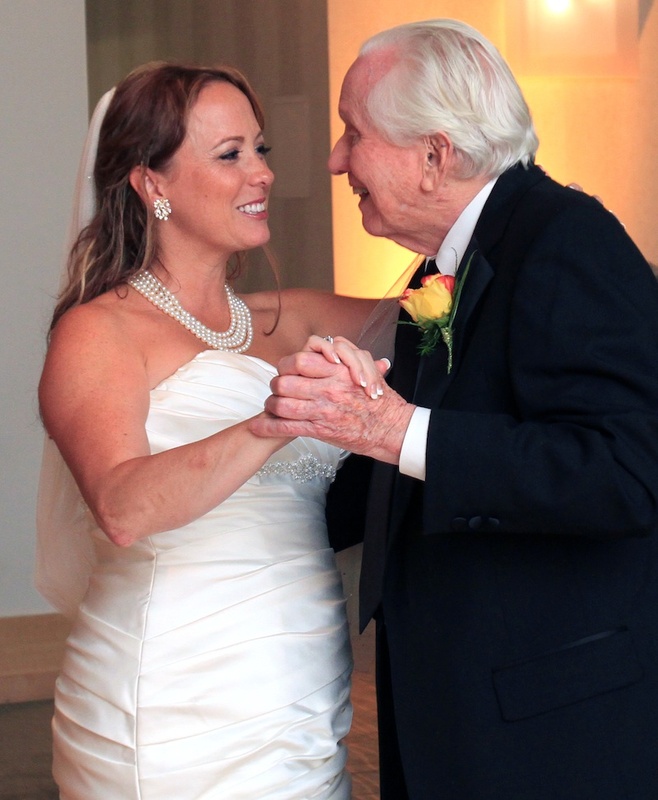 One of the bride’s earliest and dearest memories is her Dad teaching her to dance when she was perhaps five years old, with her feet resting on his to learn the steps – to the sound of “New York, New York.” Needless to say that this was the song chosen for this special dance, and it became a truly magical moment! 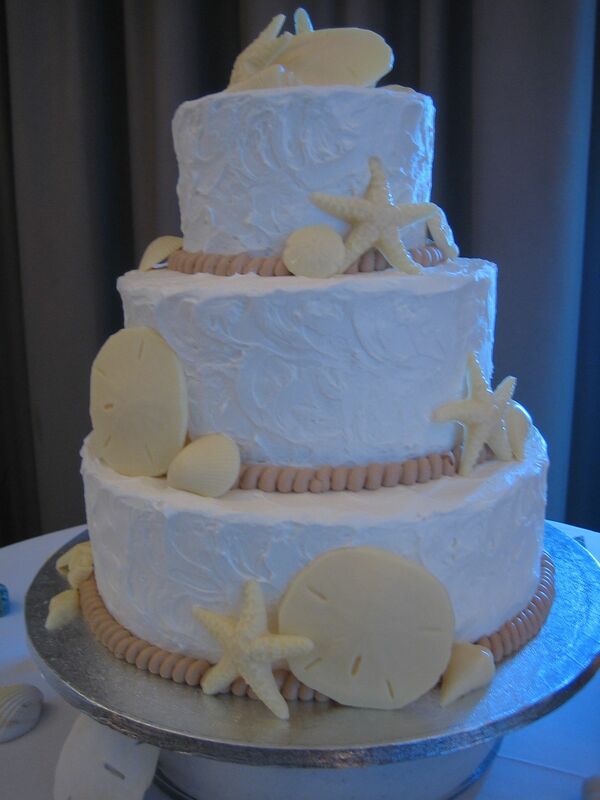 Then there was more dancing, and a cake to cut – a little masterpiece by Freedom Bakery, decorated with rope motifs, seashells and sand dollars – so beautiful and so delicious! 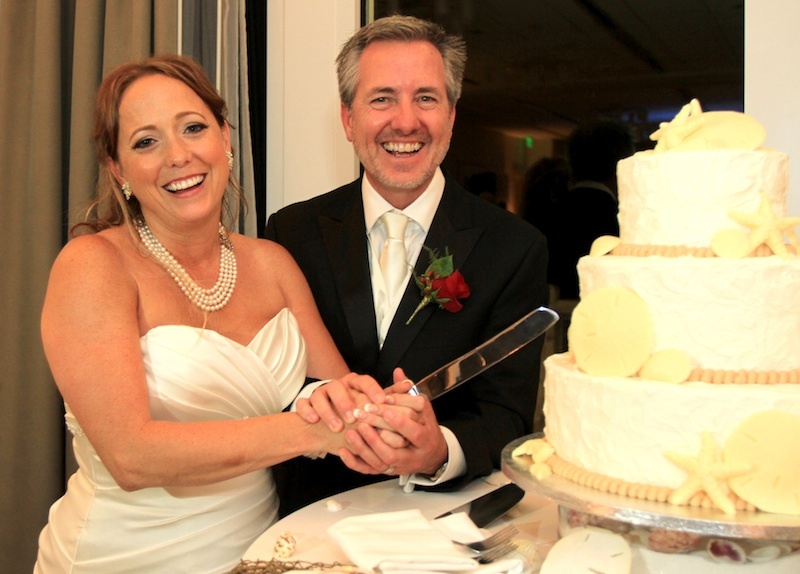 Stacy’s and Ian’s first official task as husband and wife: cutting the cake and feeding each other! 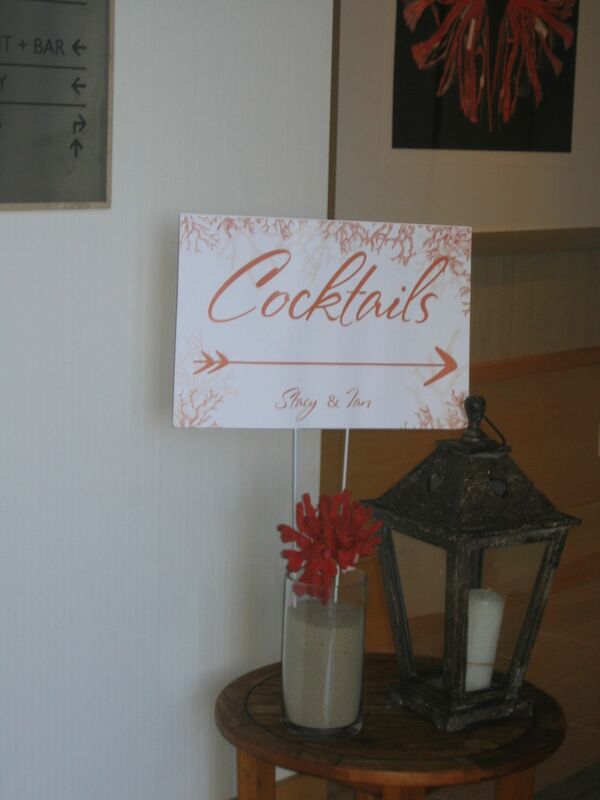 Guests loved it… and photographer Randy Tunnell recorded every precious moment throughout the day. 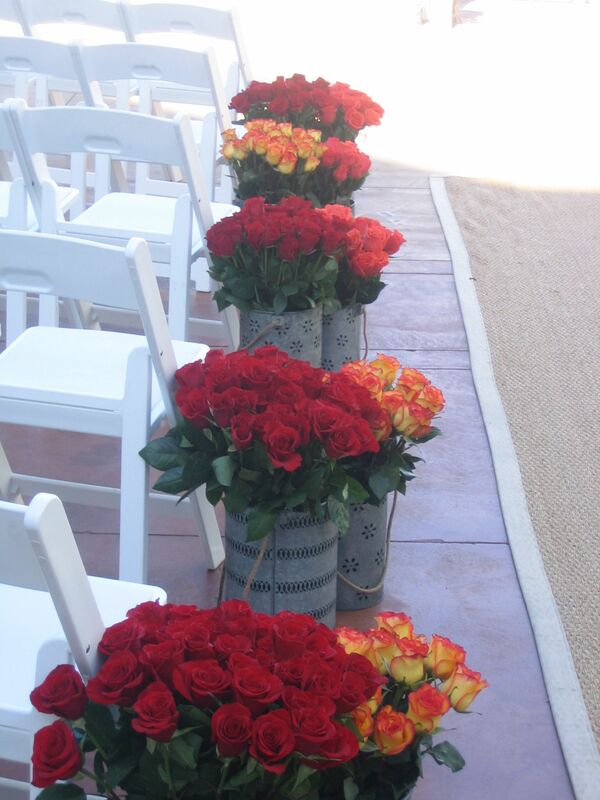 It was a beautiful, elegant, joyful, romantic wedding- and I was reminded one more time why I love my job so much! 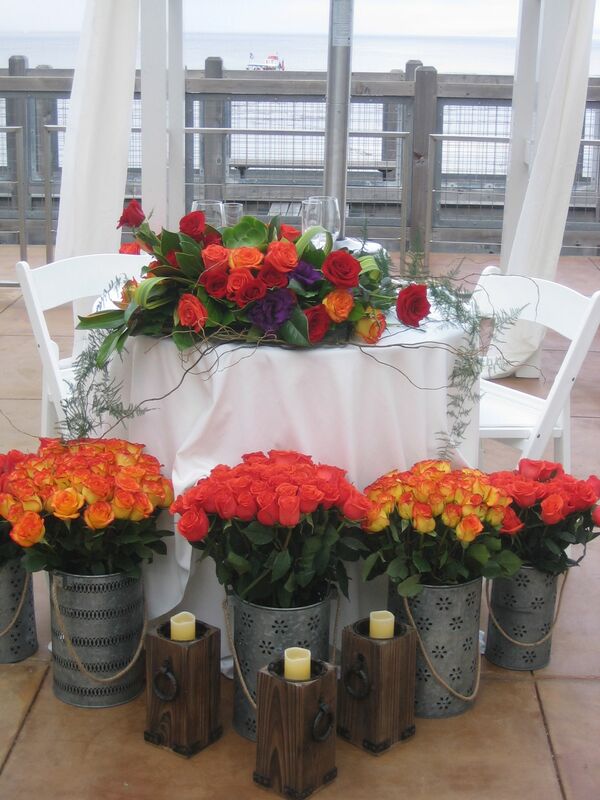 Thanks, Stacy and Ian, for letting me be a part of your Great Day, and a long and happy life together!